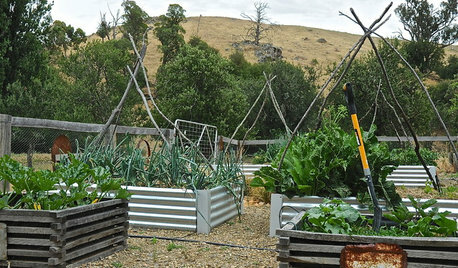 Vegetable Garden design fitting into the landscape? 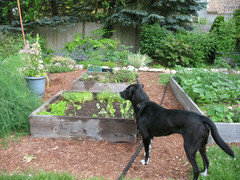 I have a small 1/4 acre property and grow vegetables. I have wooden beds that are ready to be replaced and I've decided to basically double the number of vegetable beds. I've pretty much decided how many and where they need to go for sunlight but still making minor decisions about size of the beds and placement. Of course, I want it to look as aesthetically pleasing as it can, because it's not in an out of the way corner, since it's a small yard. I have 4x4 size beds at the moment because my backyard is very rectangular and flat and squares appealed to me. The long sides of the entire backyard are east and west and are 90ft with the house parallel on the east side. The short sides are south and north and about 45ft. 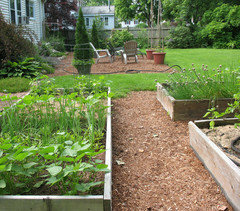 The vegetable area needs to be in the north 1/3 end of the backyard rectangle open to the sun in the south. The area I have available is about 20 square feet more or less. I want to build 2 long beds and 6 small beds. The possible sizes are 16ft x 4ft, or 12.5ft x 4ft for the two long beds. The small beds I'm thinking of making them 4x5ft or 4x6ft. 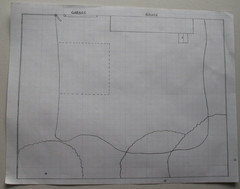 And I need a 2.5ft path between the beds while still lining up the large and small beds. It probably makes very little difference between these sizes. It will end up being a 20ft sq of vegetable beds regardless. I just keep thinking there might be something else to do that might fit the landscape better, but I'm not seeing it. I thought of arranging the beds diagonally which might make the yard look larger? But I ran into issues with tree roots in that position, so I've let go of that idea, I think. I probably should go try them going in the other direction before giving up on it. Then I keep thinking of trying to break up the 20x20 square area and place the beds more randomly in some way. Haven't figured out a way to do it that pleases me, yet. Or putting the long beds in an arrow point and filling in behind them with the smaller beds. Or making all the beds all the same size and different dimensions. Or graduated sizes. The only thing that needs to remain constant is the 4ft sides of each bed, no more or less, and the pathways that are best at 2.5ft. 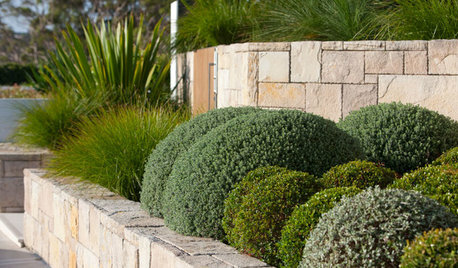 The perimeter of the yard is curving beds of shrubs. I plan on accentuating the curve of those beds and adding a curved pathway either through the vegetable bed area or along the east side of it. I also want to shape the lawn that remains into an oval shape, it's a little too large for a circle. One last thing I want to do, is add a water garden in a galvanized tub. I've seen a photo of it done and they have circular sizes and rectangular rounded end sizes. 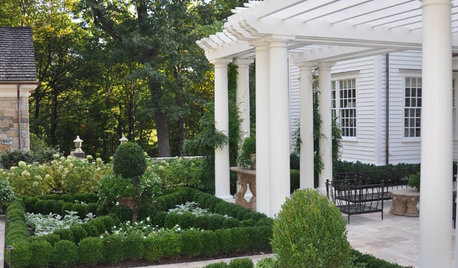 And I'd either want to place it between the vegetable beds and an adjacent sitting area, along the pathway, or incorporate it into the vegetable area. 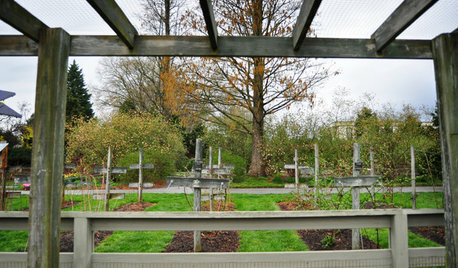 There is a photo below of one of the water gardens in the vegetable garden area that I'm looking at. My beds will only be one foot high and I think the beds in that photo are higher than that. So I guess I'm wondering about all the different shapes, mostly rectangles and curves and how best to combine them and make them fit into the landscape. Wondering if anyone has any ideas or thoughts? Here is another application using a different shaped galvanized tank, that they've painted. I could use those tanks for a water garden instead of the round one. I'd even like to use multiples of them, but they aren't cheap. That's a lot of information to digest! (There's a substantial difference between 20 sq. ft. and 20 feet square.) To make it much easier, could you draw and submit a simple sketch to show what space is available? 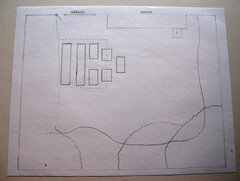 Show in the sketch what you propose. People can easily react to it and make suggestions. Why not also add a picture of the actual area? Ok…thanks for the suggestion. You're right of course. I have a scanner that's not working at the moment and didn't think I had a good photo of the area, but I'll give it some more thought. And the area is 20ft x 20ft. That's a good idea, I hadn't thought of taking a photo and uploading it. I'll give that a try today. Thanks, again! This is about the best I could do. The area with a broken line around it is the area in the yard that has the most sun. 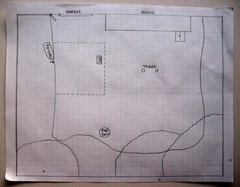 Where I would need to place the raised vegetable beds including the pathways. I could enlarge the area by maybe 5ft more toward the trees, but then I am getting into more shade and tree roots. Each square represents 2.25ft. The house and garage are on the East side of the property. The trees in the back are all Silver Maples. I also found a few photos that get little corners of that area although not one photo of the whole area. This photo is looking toward the Northwest corner of the yard. And the outer edge of the vegetable area. And this photo is from the northwest corner looking back to the other side of the property. I hope that helps to make some sense of my property and my project. "I hope that helps to make SOME sense of my property..." The problem, though, is that in working out landscape, one must make COMPLETE sense of the property that is within the scope of "work." A half-baked understanding doesn't prevent erroneous and error-prone advice from being dispensed. It is difficult to grasp the lay of the land since one cannot tell how the pictures correlate to one another. The plan (good effort!) helps, but it looks like there are a few differences with the pictures. That means that this is practically a shot in the dark: I'm thinking you could stand a little more clearance from the house corner in order for improved passage, thus the notch out of the corner of my veggie bed arrangement. 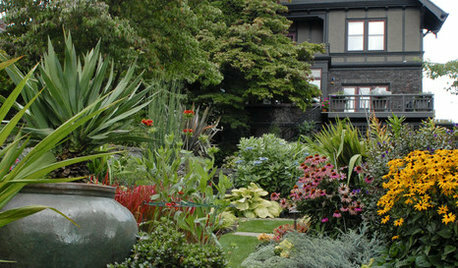 The rest is redefinition of the lawn ... more landscape space / less lawn. Yes, it has to be hard to offer advice on a forum, for property and gardens that you haven’t been able to see. 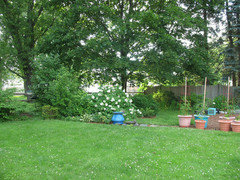 Really, the photos I posted show about 80% of the back yard, so there is very little else to see. The only thing further I could do to give you context, is post another shot of the drawing where I have marked off where the bird bath is, where the dog was standing, where I would have been standing when I took photo #3 and where the pots with tripods would be that are in the sitting area in photo #3. See below. But really, I could have been clearer in explaining what I was looking for. Obviously, the sunniest part of the garden where I drew the broken line, is the ideal place to put vegetable beds, but I was trying to figure out if there was some way to incorporate the vegetable garden area into the overall landscape that would make it more cohesive. Rather than just plopping the beds down in a square like a postage stamp. I have been coming to the conclusion that there was little else for me to do, but I just thought I’d give it a shot that someone with more design sense than I have, might see something I don’t. I appreciate your arrangement of beds, I hadn’t thought of combining the different sizes that way. And I’m glad you brought the tight quarters of that corner of the vegetable area to my attention. With each square representing 2.5ft. it looks closer than it is, but it still could use a little more space. 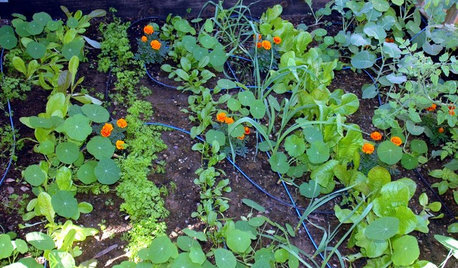 If you look at photo #3, you see the vegetable beds as they are arranged now and the sizes of the beds, which will change somewhat. And you can see the strip of grass between the vegetables and the sitting area. In order to enlarge the growing space, I will have to remove that strip of grass and have the beds right up next to or into the sitting area. Which I don’t mind because it is a larger space than we use anyway. I just wondered if some layout or some added design element might combine the two areas better. I’ve also thought about creating a diagonal layout by adding some 3ft high picket fencing in some way, around the vegetable area. Even cutting into the main part of the lawn with a diagonal line of fencing between say the closest clay pot with tripod over to the blue birdbath. Using some of the area that is not ideal for beds of vegetables for that water garden I talked about and blueberry bushes toward the trees where roots and some shade won’t be a problem for them. I haven't tried to draw a design for that idea yet. 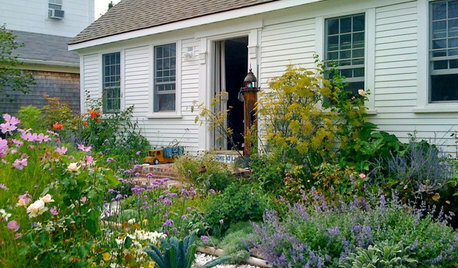 I don't want to cut too much into the main lawn and if possible I'd like the lawn area and the vegetable area to at least be in proportion to each other and be of equal size, more or less. I'd also like to have the water garden element close to the sitting area so it can be seen from there and perhaps from the windows. So I haven't decided yet, whether to separate the water garden idea from the vegetable garden project or combine them in some way. 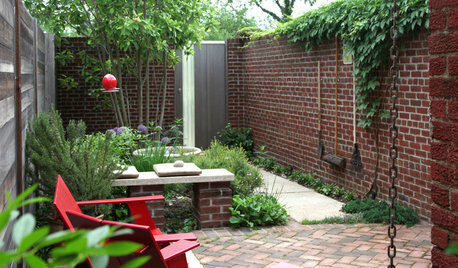 I like the idea of water in the vegetable garden and by the sitting area, so maybe I want two? I realize my writing on the sketch is small, but if you click on the photo it appears in a separate window and you can zoom in. 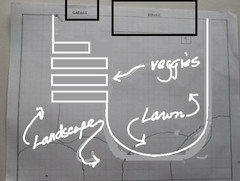 Here is another thought I had about breaking up the square 'postage stamp' look of the vegetable garden area. Which also takes care of that tight corner. What do you think about that? One problem I see, is the two long beds would be for taller crops and one long bed in front of another would shade the plants in the last bed....…. Of the two arrangements, I prefer mine with the square-ish layout. It plays off of and correlates to fence and building walls. If you want to get rid of less lawn, maybe the boxes could be pushed a little toward the side fence (into the landscape area.) The other -- arrowhead shaped arrangement -- seems not to be building on something that already exists, but is more like a foreign element coming from out of thin air. There is really no need to be cute. Something straightforward seems better for the long haul. I think the main thing in making it work overall will be how the lawn edge is shaped and connected to the boxes. 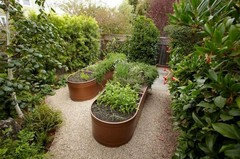 If you google for images of potagers, you may see some examples of raised bed arrangements that you find pleasing. Yardvaark, thanks for your help. I had been wondering if there was something I wasn't seeing and I thought I'd put it out there. Appreciate your time. I have been working on this for days, needing to get moving and be ready to get seedlings into beds soon. I ordered wood yesterday for delivery tomorrow, so I had to speed things up today. I took your advice to heart, and kept more space near the corner of the house. I also didn't end up liking the first idea I suggested either. And couldn't get the diagonal idea to work either and gave up on that pretty quickly. And I'm sure you are right to keep it simple. I am also planning on making sure the lawn is well defined. We often do edge it in the spring. I remembered that my sitting area in the back of the house is exactly 30ft x 20ft. And I decided to make the vegetable plot exactly the same dimensions and notch it into the sitting area, overlapping a corner of it. Hard to explain, but I think I'm going to go with it. At least, I'm going to sit with it through tomorrow and make a definite decision by Monday morning. But thanks so much for your help! Babs, I actually did do google images half the day today. [g] Looking for vegetable bed layouts with raised beds. And I did fool around with one that caught my eye for awhile, but in the end it wasn't going to fit my space. So, finally it really just came down to practicalities. What kind of wood was available, the dimensions I could find. 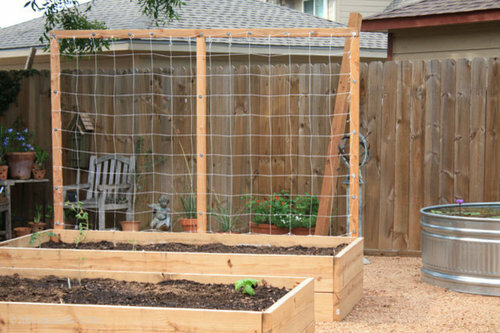 The need to trellis some plants, what size paths I feel comfortable using and the maximum width of the bed that I can reach the middle of, etc. The idea of repeating the size of the sitting area, just came to me and that seems to have pulled it all together. At least for tonight. Hopefully, I won't think of some drawback tomorrow that I haven't thought of yet. Thanks for the suggestion, I appreciate it!! And I'll probably do another search in the morning for potager and see if there's anything else I missed. Another thought occurs ... aren't these boxes, more or less, assembled and then installed? If so, you could build and arrange them and have the opportunity to tweak and rearrange until you like it ...OR ... you could paint (with upside-down marking paint) lines on the ground which represent the boxes. Marked out, it's fairly easy to step back and appraise from different viewpoints. 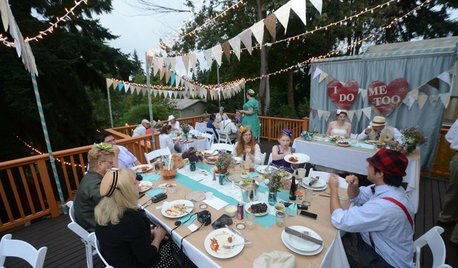 (The paint can be scrubbed out for changing or use a second color; it can get messy!) $5 or $10 of paint is much easier and less expensive than changing wood. Finally, maybe a round set up, with pie shaped beds? Thanks olychick! Pineterest is a great resource too. 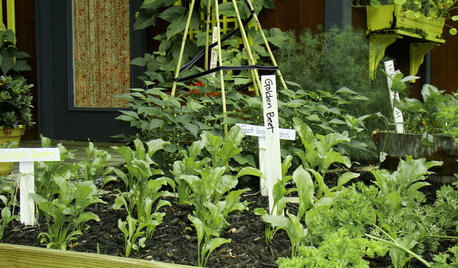 There's no end to the creativity of gardeners, is there? Great examples. I do like those basket weave planters for beans, very pretty. 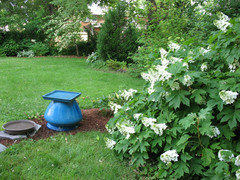 Although I was planning on using the galvanized tubs for a water garden. And believe it or not they are expensive! Finally, a 50 degree day and sunshine on the schedule today! 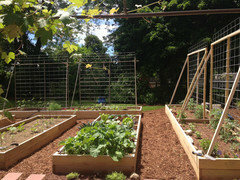 Hope to get these beds made soon and get the vegetable garden growing for another year. Everyone is very happy with the result and now we're just waiting for ripe tomatoes! Local street regeneration - landscape design. Help! What is this and how do I get rid of it and it’s roots? Landscape fabric - should I pull it up?